You want to play better golf and you want to take steps to improve your overall fitness and well-being. But you don’t want to wear or carry multiple devices to help you achieve those goals. That’s why our Approach X40 GPS golf band is the ideal all-in-one solution. 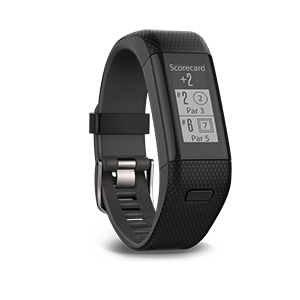 Preloaded with more than 40,000 golf courses worldwide, it combines daily activity tracking with wrist-based heart rate plus vibrating smart notifications to keep you connected on the go. 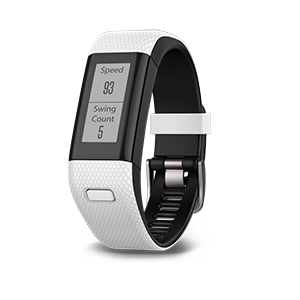 The golf band’s Elevate wrist heart rate technology measures heart rate at the wrist 24/7. That gives you the freedom to work out with no additional heart rate strap needed. Using heart rate, Approach X40 provides calories burned information and quantifies the intensity of your fitness activities, providing better credit for your efforts1. 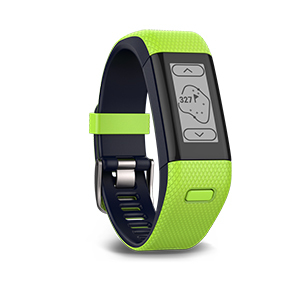 Only Garmin lets you combine golf GPS with fitness tracking with smart connectivity, all-in-one slim, low-profile wristband that’s as durable and comfortable as it is versatile. Water-rated to 50 metres and featuring a rechargeable lithium-ion battery, the Approach X40 golf band also gives you the current time and date — plus an alarm setting — so you can wear it every day to keep your active life right on schedule. Approach X40 is a true go-anywhere golfing partner. So, no matter where you’re teeing off, it knows where you are — and how far you are from the next pin. The band’s high-sensitivity GPS receiver gives you the distance data you need to play with confidence. Plus, the crisp touchscreen display accurately shows distances to the front, back and middle of the green — even when you’re under tree cover. 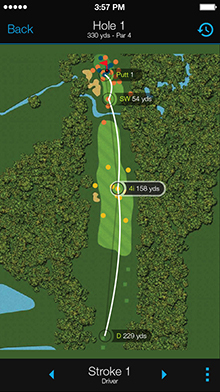 AutoShot™ game tracker automatically tracks shots3 along the fairway and measures distances for post-round analysis on Garmin Connect. Never miss another important text, email or alert just because your smartphone is tucked away somewhere in your bag. Approach X40 acts as a wireless extension of your compatible smart device, displaying smart notifications, right on your wristband2. Now, via Bluetooth® technology, you can read that email or text you’ve been waiting for — even in the middle of the fairway. 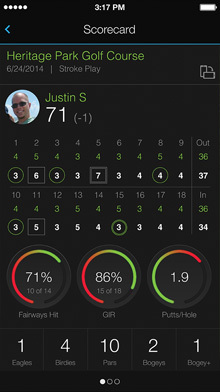 With its built-in digital scorecard, Approach X40 golf band makes it easy to keep track of your score throughout each round. When you’re done, you can save, review and even use Garmin Connect™ Mobile with your smartphone to automatically upload and share that great round with your golfing partners online. By combining the easy-to-use Garmin TruSwing club sensor(sold separately) with your Approach X40 golf band and compatible smartphone or tablet, you can access real-time, 3-D animations and other useful swing metrics to see how your mechanics affect ball flight and shot results. 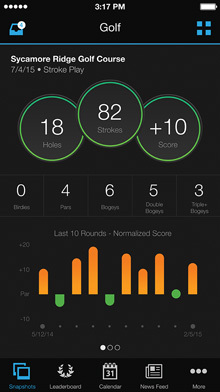 Using the Garmin Connect Mobile golf app, you can instantly analyse swing tempo, speed, club-path measurements, critical club angles and more. With the Approach X40 golf band, your purchase is an all-inclusive investment. It comes ready to go, right out of the box with preloaded courses. Plus, new courses are added and existing courses are updated periodically, using our Garmin Express software. Best of all, these course updates are free with no setup charges, fees or subscriptions.